C. A. Buffington & Co. (Berkshire, NY), Automobile Folding Chair, patented 1912. Milwaukee Art Museum, Gift of David and Toni Damkoehler, M2011.10. Photo by John R. Glembin. Do you think this rusty iron folding chair deserves a place in a world-class art museum alongside priceless paintings by Mark Rothko and Vassily Kandinsky? It looks like something you might find in a barn. Well, in fact, it did come to the Museum from a barn, and we are thrilled to have it. 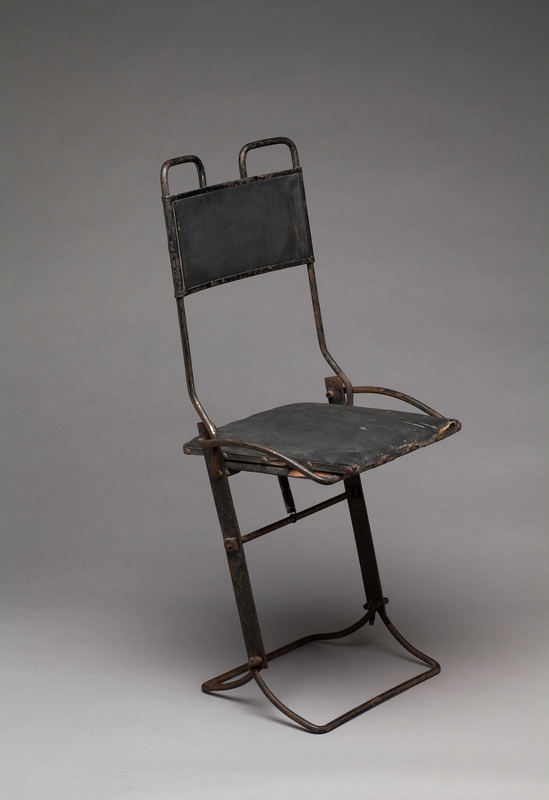 This metal folding chair is a patented design made sometime in the late 1910s by the C.A. Buffington & Co. manufacturers in Berkshire, New York. 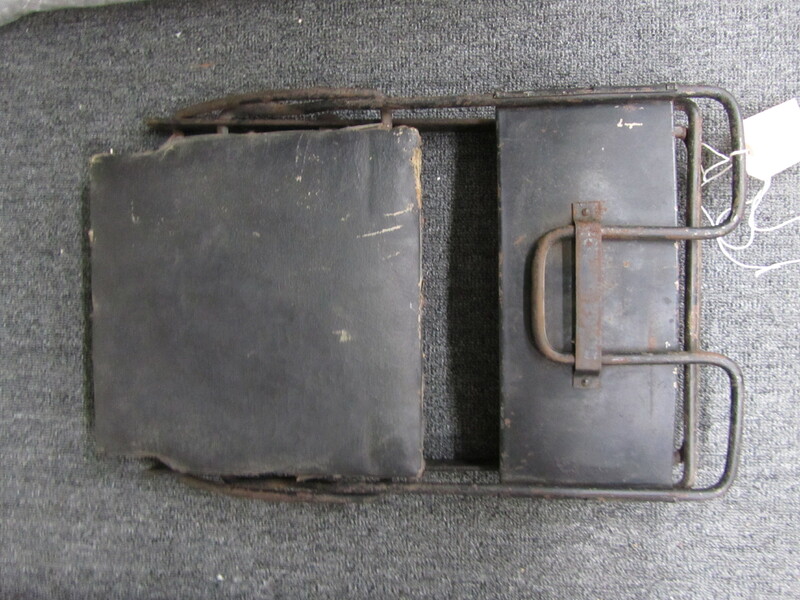 Buffington specialized in designing all sorts of equipment for the newfangled automobiles of the “Horseless Age“, including special jacks for changing tires, luggage carriers, and special automobile folding chairs like this one. So how and why did this chair come to be part of the Museum’s Collection? The chair was a gift from David and Toni Damkoehler, friends of Museum Director Dan Keegan. The Damkoehlers knew that we are interested in building our 20th-century design collection and that our institution is never afraid of “quirky.” They had this unusual chair as part of their collection (yes, kept in a barn!) and asked, Would the Milwaukee Art Museum be interested? As the curator working with this part of the collection, I investigated this bizarre object. On one level, I knew it was visually interesting and it seemed to have a good story. But did that warrant it becoming part of an art collection? Is it aesthetically compelling? Is it the best example of its type? Does it fit into an overarching story about design movements? C. A. Buffington & Co. (Berkshire, NY), Automobile Folding Chair (in folded position), patented 1912. Milwaukee Art Museum, Gift of David and Toni Damkoehler, M2011.10. Photo by the author. I learned that this chair was designed in response to a specific need, or, in another way of looking at it, designed in response to newly developed market. In the 1910s, American car culture boomed. 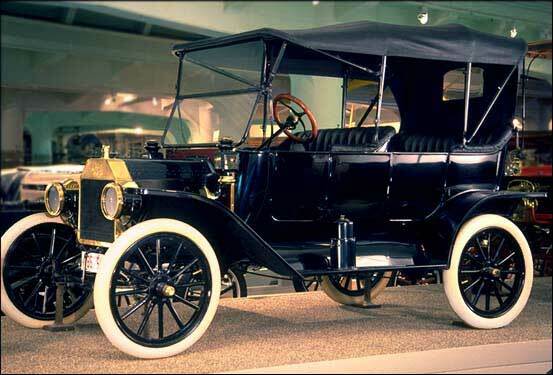 Fifteen million of Henry Ford’s Model-T automobiles rolled off the assembly line between 1908 and 1927. This means that at least 15 million folks enjoyed a new type of mobility and could spend their leisure hours exploring with their new cars. A market developed for objects like driving gloves, touring maps, and collapsible “automobile chairs”. You can see above how compactly the chair folds, allowing several to be fit into the limited stowage of a Ford Model-T.
Henry Ford's "Model T". 15,000,000 were produced from 1908-1927. Image from The Henry Ford. http://www.hfmgv.org. A further object of the invention is the provision of a chair which is simple in construction, capable of being readily and compactly folded, possessing maximum strength and durability, and that may be manufactured at a minimum expense. To me, in this unrelated context (a patent application), Buffington clearly summarizes one of the tenets of Modern design–to efficiently mass-produce simple objects that were made of strong materials in the right shape (ie: Form follows function). 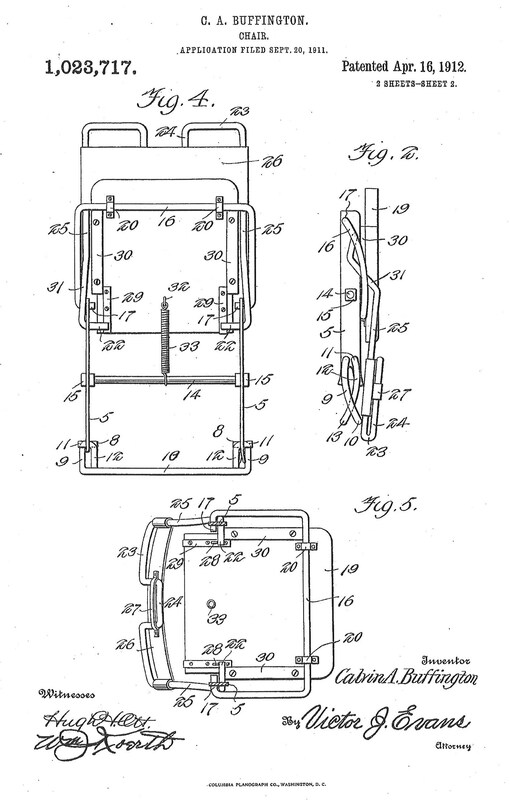 Diagrams from United States Patent #1,023,717 (April 16, 1912) for C. A. Buffington's Chair. From Google Patents. He doesn’t, however, mention whether he aims for this folding chair to be attractive or pleasingly-proportioned, a mandate for good Modern design. And that brings us to the aesthetics of this chair: Is it attractive? Does it matter? After pondering how the chair would fit into a timeline of chair design, and alternately, how it rather exists outside of a standard chronology of furniture history, I fell for this chair in ways both academic and aesthetic. I think it has great personality, a terrific shape, and it was inarguable in wonderful condition. I dunno, I just liked it. Just when I’d decided that I would go out on a limb and move forward with bringing this chair into the Museum’s Permanent Collection, I learned that The Metropolitan Museum of Art scooped us and acquired a Buffington Chair in 1979. On one hand, I felt vindicated that the response I’d landed on (Chair = Museum worthy!) was the same as The Met, on the other hand I was disappointed that we wouldn’t be the only Museum with this wonderful quirky chair in our collection. Mel Buchanan is the Assistant Curator of 20th-century Design. Mel’s curatorial responsibility includes interpreting, displaying, and building the Museum’s collection of craft, design, and decorative objects. This entry was posted in Art, Curatorial and tagged 20th century art, automobile, Buffington, Collection, Design, From Museum Storage. Bookmark the permalink. Hi, came across this while doing research on a C.A. Buffington folding stool that I found. The pat. date is 1909. Any info. on this piece would be greatly appreciated.